The purpose of this page is to give you information seekers an easier way to diagnose your pain on the bottom of the foot, including the ball of the foot. I have noticed that many people use bottom of foot pain as their "search" term. by knowing where the pain is occurring it becomes easier to identify its source. Although my homepage has a Foot-Pain-Finder which helps you identify the type of pain you may be suffering from, I thought a page listing specific symptoms on the bottom of the foot would make things simpler. I have listed the more common problems that we foot specialists see on a regular basis, but this list is not all inclusive. All of these problems have separate pages which discuss the condition in greater detail. Hopefully this will help you in your search for pain on the bottom of the foot. plantar fasciitis Pain due to inflammation of the long ligament that raises the arch. The pain of plantar fasciitis is generally more common where it attaches into the heel. It is important to note that plantar fasciitis may cause pain anywhere along the bottom of the foot. heel neuroma This is a nerve entrapment, or pinched nerve, that occurs in the heel area and in many instances is misdiagnosed as plantar fasciitis. The pain is typically found on the bottom of the heel, but there may also be pain on inside portion of the heel. lateral column pain This condition is essentially a destabilization of the outside portion of the foot with most of the pain occurring on the bottom of the foot towards the outside of the foot. In many cases this can be attributed to over aggressive surgery for plantar fasciitis. plantar fibromatosis This is a nodular growth that occurs off of the plantar fascial ligament found on the bottom of the foot. It is usually a benign growth and in most cases is not painful. 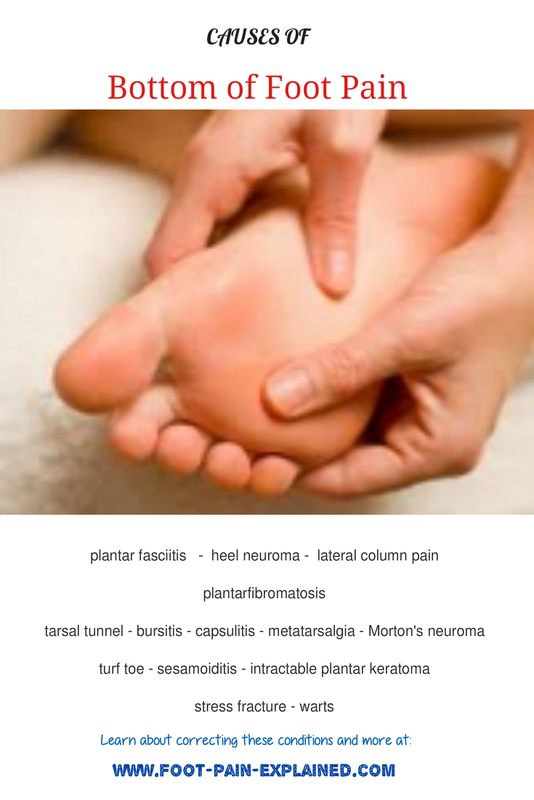 tarsal tunnel This is a nerve entrapment occurring on the inside of the ankle which may then cause symptoms such as burning, tingling, pain and numbness on the bottom of the foot. bursitis A painful mildly red and mildly swollen area usually found on the ball of the foot, either underneath the middle metatarsal heads or on the side of the foot adjacent to the metatarsal head. capsulitis Inflammation occurring on the bottom of the foot just behind the toes due to an overstretching of the ligament that attaches the toe bone to the metatarsal bone. metatarsalgia Pain occurring on the ball of the foot usually reproduced by direct pressure to the head of the metatarsal bone. Morton's neuroma A nerve entrapment generally occuring behind the third and fourth toes which will send shooting pain, tingling, burning or numbing sensation into the toes. turf toe is mainly an athletic injury due to over extension of the big toe (toe is bent upwards) thus resulting in pain on the bottom of the big toe where it attaches into the bone behind it. sesamoiditis Pain behind the big as a result of trauma to the sesamoid bones which are two small bones located underneath the first metatarsal bone. The pain will be on the bottom of the foot. Freiberg's disease In this condition, the growth plate of the metatarsal bones undergoes atrophy due to a cut off in the blood supply to the head of the bone. intractable plantar keratoma (IPK) This is a cystic growth that occurs on the ball of the foot as a result of a mal-alignment of the metatarsal bones where too much pressure is exerted on one of the metatarsal heads. stress fracture Pain at or near the ball of the foot may be due to a stress fracture. There does not necessarily have to be a history of trauma in order to break a metatarsal bone. If no other cause can be found for this sudden onset of pain, then an x-ray is needed to rule out a stress fracture. A growth such as a wart may also cause pain on the ball of the foot.